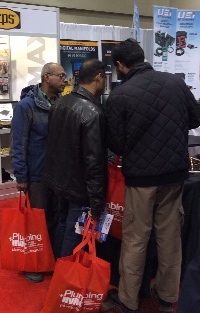 Registration has opened for CMPX 2016, Canada’s national show for the HVACR and Plumbing industries from March 16 to 19. Organizers say it is Canada’s biggest HVACR and plumbing show, with more than 500 exhibitors filling the 200,000 sq. ft. Metro Toronto Convention Centre, North Building with “an un-equaled display of new products and the latest technology for every area of the HVACR and plumbing industries,” says a CMPX news release. “CMPX is a ‘must see’ for technicians, contractors, wholesaler distributors, architects, engineers, specifiers, building management and other professionals in the plumbing and mechanicals industry,” the news release says. Online registration is open now at cmpxshow.ca and the show committee has maintained the 2014 show pricing of $10 per person for advance registration. The show floor includes the new CMPX “Connections” theatre with learning forum sessions. Visitors can also register to listen to keynote speakers at a daily breakfast for $25.00 per person. Some wholesaler distributors will participate in the CMPX bus transportation program to make attending easier and more social. There are discounted hotel rates available. Accommodations should be booked directly with the hotels and not third-party brokers acting as agents.